ClockWatch Radio Sync time synchronization works by using a WWVB receiver that is connected to your computer. Beagle Software has designed a software interface to turn your computer into a network time source. ExactSet clocks also receive WWVB broadcast for time syncing. Here are some frequently asked questions about radio time reception. Feel free to us with other questions you have. How does Radio Sync/ExactSet get the time from the NIST ? How does the NIST broadcast the signal? How accurate is radio time synchronization? Can I receive the broadcast where I am? Do I need an Internet connection to use the broadcast? I already have a WWVB receiver; will Radio Sync work with it? Why would I want to use radio time syncing? Will my clock or receiver work outside of the United States? How does Radio Sync get the time from the NIST? Radio Sync contains a specialized receiver and decoder to convert the broadcast. A highly accurate one-pulse-per second output is provided to Radio Sync from the WWVB receiver. This rising edge of the signal is synchronized to the the start of each WWVB second. WWVB time synchronization is highly accurate, but your results will vary depending on your receiver and computer. The Garmin WWVB35 receiver is accurate to within a millisecond of UTC; however, the time that is ultimately synchronized to your computer will not be as accurate. Why? Because computer systems are not fast enough nor consistent enough for better accuracy. Our tests show an accuracy of +/- 0.1 second using the Garmin WWVB35. You need a WWVB receiver, antenna, data cable and serial port connector. These come standard with the Radio Sync. The only other requirement is a functioning Windows PC with an available serial (COM) port. Do I need an Internet connection to use WWVB? No. WWVB does not require an Internet connection. No. Radio Sync has been qualified to work with the Radio Sync receiver. Why would I want to use WWVB for time synchronization? Time syncing using WWVB is a good alternative for remote or highly secured computers. ClockWatch Radio Sync does not require an Internet or modem connection. WWVB time synchronization may potentially be more accurate than syncing over the Internet or by modem. The true accuracy depends on the receiver as well as the computer. Beagle Software's experience is that the Radio Sync when used with the supplied WWVB receiver is consistently accurate within 0.1 second. 06:00 UTC is about midnight in the central United States. (click on the map to see a larger image). 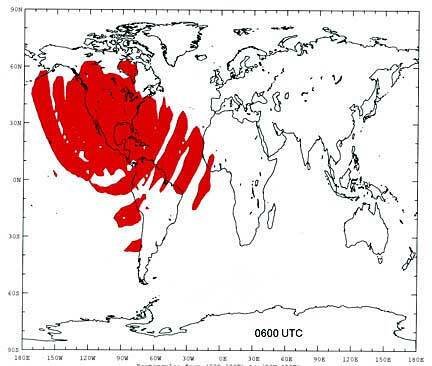 This coverage map is based on a field strength of 100 microvolts per meter, which in theory should be a large enough signal for most receivers to work with. In fact, the Radio Sync receiver has much better sensitivity (50 microvolts per meter). Therefore, use this coverage as a rough indicator only. We have heard from many owners of radio-controlled clocks whose clocks do not work inside the coverage area shown on the maps. This is probably due to a local source of interference. We have also heard several reports from Alaska that the clocks work fine, even though Alaska is outside the coverage area shown on the maps. This is probably due to the low amount of radio background noise found in a sparsely populated area. The radius of signals broadcast by the US Atomic Clock do extend into Canada in some limited locations close to the US-Canadian border. ExactSet clocks will not work in Europe where a different standard is in use. Q: Will a Clock function in Alaska or Hawaii or Europe? A: With certain limited locations in Canada close to the US-Canadian border, the ExactSet Clocks are limited to the continental US. S version ExactSet Clock will not receive broadcast in Europe or other locations outside of the signal radius of the US Atomic Clock.. Every ExactSet Clock can be manually set for those occasions when outside of the signal radius of the Atomic Clock for which the ExactSet has been programmed for. The IRIG-B from the Model TL-3 is suitable for remote display driving, magnetic tape recording and many other uses. The IRIG code provides Universal Coordinated Time (UTC) or local time in a 24 hour format. IRIG-B Code Format. The amplitude modulated, serial format of the IRIG-B is divided into three segments. The first segment encodes time-of-year binary-coded-decimal (BCD) notation. The second segment encodes control functions. The third segment sometimes encodes time-of-day in straight binary seconds (SBS) notation. This segment is not encoded by the TL-3. These three segments are contained within one "frame". The frame length for IRIG-B is 1 second long and contains 100 "elements" (pulses) each of which starts every 10 milliseconds. An element may represent either a binary zero, a binary one, a reference marker or a position identifier. A zero is 0.2 of the duration of an element, a one is 0.5 of the duration of an element and a position identifier or reference marker is 0.8 of the duration of an element. A reference marker locates the beginning of each frame and a position identifier marks the end of every ten elements. IRIG-B has ten position identifiers per frame. The elements prior to the position identifier P5 comprise the time-of-year segment. The first ten elements encode the seconds, the second ten elements encode the minutes and so on through days. Each element is a digit in a binary number with a place value sequence 1-2-3-4. Two flags are encoded in the control function segment of the IRIG-B code. The first flag encoded at element P5+40ms is the LOCK indicator. It is a binary 1 when the unit has exceeded the time loss interval of the TL-3. When the second flag encoded at element P5+90ms (Time Quality #4) is a binary 1, the error has exceeded +/- 500ms. On the TL-3 receiver, the output of the IRIG-B is a 3.5 mm miniature phone jack where the tip carries the signal and the body carries the ground.